8th (Mon): Admitted to hospital. 11th (Thurs): Discharged from hospital. 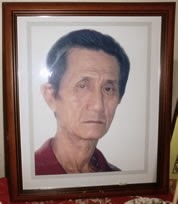 15th (Mon): Died at home & cremated at Mandai crematorium. 16th (Tues): Sea burial for remains. I haven't blogged for much of this month because my dad passed away. He was admitted to hospital for the first time on 8th (Mon). After 3 days his lung infection has improved & thus discharged on 11th(Thurs). He doesn't smoke nor alcoholic with no medical complications which is why condition improved with 3 days hospitalization treatment & discharged. However weakness due to poor appetite eventually led to his death at home. He ate & drink very little during his stay at hospital & later at home. Dietitians gave him nutrient water as supplement along with meals & more packets for home consumption but he still drink very little. It was eerily quiet at night & somehow i just 'auto' woke up at around 4am to check on him. Found him lying on the floor in the toilet. He was cremated at 3:30pm on the same day. Sea burial at sea near Pulau Ubin & Pulau Tekong the next day. My mum & i were mentally prepared for the worst when he ate/drink very little at home. He has difficulty standing & only consume a bit of food/water when threatened with going back to hospital again. In fact when he passed away, my mum took out a cutting of newspaper advertisement of funeral companies to call. It was my first time going to the police station. The death certificate is obtained from the police with the paper produced by the coroner who is the first to arrive at the house. My sister who is married didn't get to see dad for the last time as my mum told me not to inform my sis regarding the hospitalization so as not to worry her. My dad & i seldom communicate. He is those bochup(heck care) type although he doesn't flirt outside. After coming back from work, he shower, have dinner, read newspapers, watch tv & then sleep. Same cycle repeat year after year after year. Although i haven't read the novel 'Animal Farm' by George Orwell, he could be described like the dumb horse named Boxer who only know to work hard. As a consoldation he always vote alternative parties unlike those even more dumb who vote for the hybrid regime. Why i cried during funeral session? As the chinese phrase says 没有功劳 也有苦劳 - don't have credit/equity, at least have 'sweat equity'. While i considered him a 'dumb horse', at least he provided me with a stable living environment without family problems of mistress, drunkard, chronic gambler etc. Burial at sea is a decision made by my mum for my dad's cremated remains. She said dad likes to travel & is better for him to be 'free'. My mood improved a lot while out at sea with the sea breeze & aeroplanes on final landing approach one after another towards the airport. S'pore is already damn crowded so why squeeze with others on the already overpopulated tiny island?